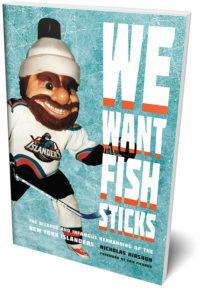 The 1990’s rebranding of the New York Islanders hockey team – which elicited merciless derision from fans and media over a new logo that was likened to the Gorton’s sea food fisherman – is the subject of a lecture February 12 by Nick Hirshon, author of We Want Fish Sticks: The Bizarre and Infamous Rebranding of the New York Islanders. Hirshon, an avid Islanders fan and former reporter for the New York Daily News, first wrote about the marketing debacle in his doctoral thesis, with the idea that he would turn it into a book. We Want Fish Sticks goes deep inside both the process that hatched the campaign, and its painful execution. The rebranding featured the logo, a new mascot, and new uniforms. At the same time, the team imported new players and a new coach, and were bought by a new owner. The ill-conceived campaign lasted 28 months. In addition to his presentation, Hirshon will interview Patrick Calabria, former Islanders VP for Communications, about the inside story on how the logo plan unraveled. Calabria, who was directly involved in the logo rebranding, is now Farmingdale’s Vice President for Institutional Advancement and Enrollment Management. We Want Fish Sticks is Hirshon’s third book. He is assistant professor of communication at William Paterson University, New Jersey.